These are some of the texts that I have written about eyewear that are published elsewhere. Please keep in mind that eyewear is a very personal accessory that can be a great outlet for expressing your style. We have for too long been paying so much for them we have not had the opportunity to express our individuality with the type of eyewear we wear at a given time. This is now about to change or actually I might say for some it is changing already. Some have indeed crossed the bridge and realize that now they can try many different looks and see what new and adventurous looks they can try. Thick frames cat prescription eyeglasses with a blue custom tint! The second time he bought a round pair, and a roundish wayfarer and yep he looks good in them…!! It’s not just me everybody is constantly complimenting him on them. 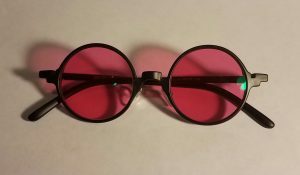 Custom tinted glasses, fun with red! So let’s try and loosen up a bit and take a chance…it’s fun playing with your style!